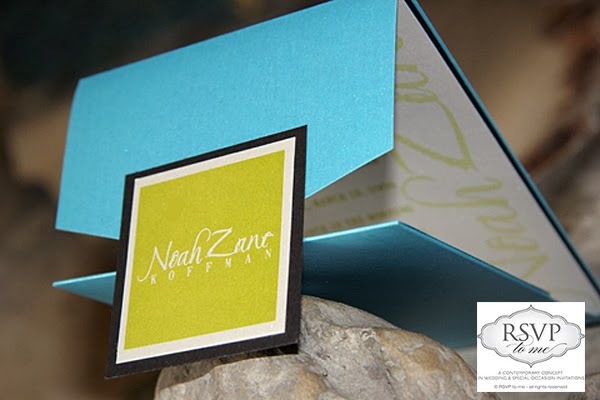 Did you know ‘RSVP to me‘ also designs stationery for special events, like bar, bat, (b’not or b’nai) mitzvahs? Celebrate this special milestone with custom invitations that showcase your child’s personality while setting the tone of this joyous occasion! As your son (bar) or daughter (bat) transforms into a respectable and mature adult during this rite of passage, their invitations, too, should reflect their dynamic and youthful persona. Glitter has become a huge trend for us at ‘RSVP to me’. 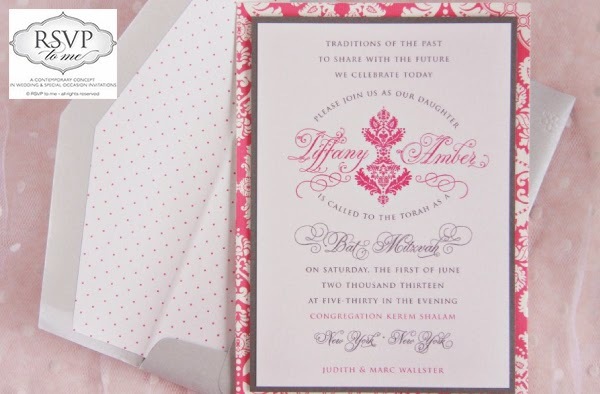 It provides a fun and glamorous look, especially when paired with a trendy pattern like this custom B’not Mitzvah invitations we designed for twin girls. Encourage guests to have fun and show off their creativity as they respond to your event with a Mad Libs style RSVP post card. Your guests will find just as much amusement in filling out their answers as you will enjoy reading them! Keep enclosure cards organized with simple back-pocket invitations. This style is a twist on the traditional pocket fold, while providing a sleek and informal look. Love the traditional pocket style? 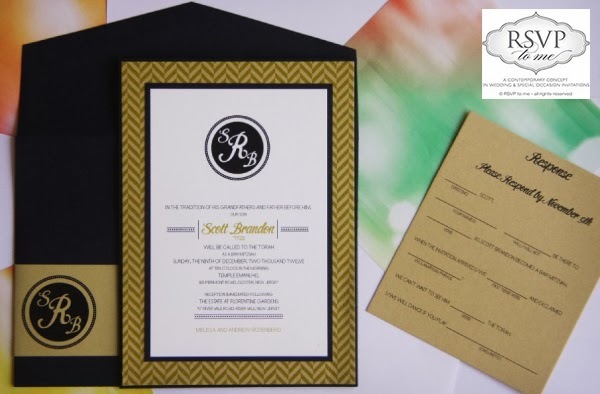 Personalize your custom invitations by not only designing them in your favorite colors but with a modern seal that includes your name or monogram. 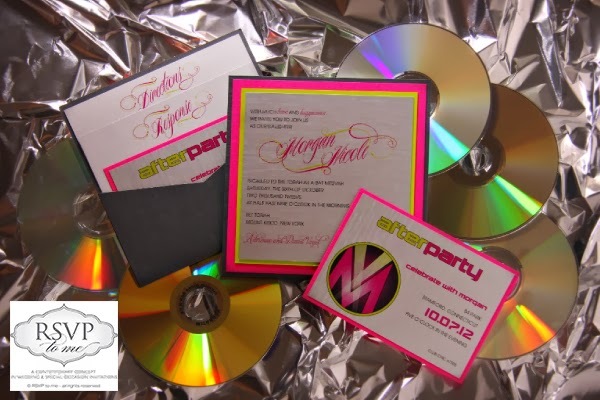 Whether you’re looking for formal, modern, traditional, or fun invitations for your upcoming Bar/Bat Mitzvah, ‘RSVP to me’ can design a style that fits your theme. For more information and to view more of our Mitzvah collections, visit us at www.rsvp-to-me.com. I am so happy with the response I’m getting to the new ‘sweet’ candy buffet business. In the few short weeks it’s been around, I’ve had some MAJOR venues interested in contracting my services. A few weeks ago, I displayed a full candy buffet table at the Celebrate Party Showcase in Tarrytown, NY. Elise and Flora put on a great show, thanks!! There was enough candy for 200 people – and I brought along some custom decorated chocolates too! The response was overwhelmingly positive. People literally stopped in their tracks to take a look (and a taste) of the blue and green themed candy. I brought along 200 special chocolate favors to hand out to the guests of the show. They were completely gone in two hours. Unfortunately, the show lasted for five hours and I had to fight off the crowd the rest of the time to keep my display intact. Went through 150 brochures also….I’ll bring more next time. At the end of the show, I handed out the custom chocolates that I brought for the display. They were a HUGE hit. Of course, I had to eat some too…the brownie pops are the best!!! There also were chocolate covered oreos, chocolate covered pretzels, chocolate lollipops and chocolate covered marshmallows on a stick (my husband’s favorite). I met some great people at the show, including some venues that are interested in ‘Sweet’. I’ve got the new brochure up on the web. It tells you all about ‘Sweet’. Click HERE to see it. The website is under construction, but it should be up and running soon. The web address is www.rsvp-to-me.com/sweet.htm .